Cindy Knows She Knows, Do You Know? 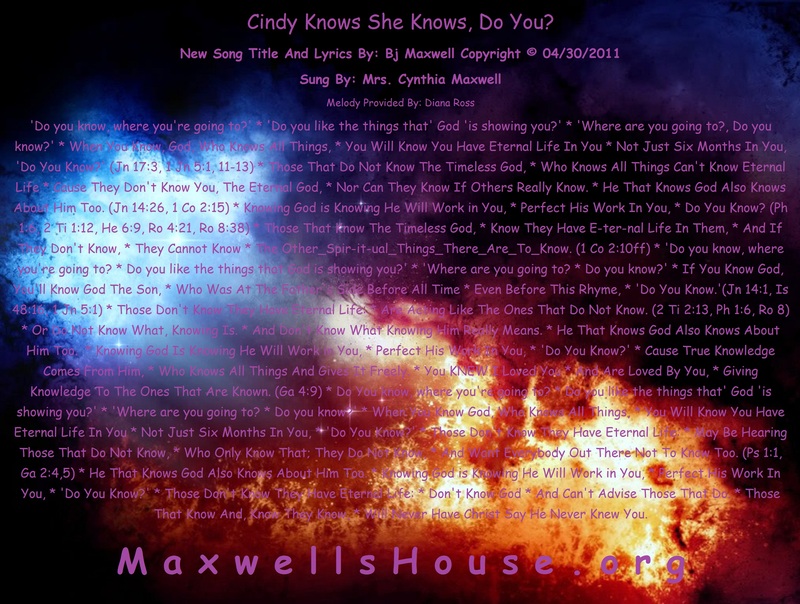 (If You Can't Here Cindy Singing, Hold Down The Shift Key And Click Here. Cause They Don't Know You, The Eternal God, Nor Can They Know If Others Really Know. He That Knows God Also Knows About Him Too. is Knowing He Will Work in You, Perfect His Work In You, Do You Know? Don't Know,They Cannot Know The Other_Spir-it-ual_Things_There_Are_To_Know. Are Acting Like The Ones That Do Not Know. Or Do Not Know What, Knowing Is. And Don't Know What Knowing Him Really Means. Cause True Knowledge Comes From Him, .....Who Knows All Things And Gives It Freely. May Be Hearing Those That Do Not Know , Who Only Know That They Do Not Know. And Want Everybody Out There Not To Know Too. Don't Know God And Can't Advise Those That Do. Those That Know And, Know They Know, Will Never Have Christ Say He Never Knew You. Keeping My Life Nice And Halfway Organized And Constructive Criticisms By Cynthia. Almost All If Not All Unscriptural Beliefs Systems Out There Teach That We Can Never Know We Are Saved And Be Secure In God. This Automatically Disqualifies Them From Being Able To Speak With Any Authority On Any Other Issue. 3) Don't Know That Knowing The Eternal Is Knowing That One Has Eternal Life. 5) Do Not Know God. They Also Cannot Counsel Them That Know and Know That They Know Eternal Things. (1 Corinthians 2:15) Those That Know God Or Are Known By God Can Never Be Unknown To God Or Have Him Say, 'I Never Knew You.' (Matthew 7:23; 1 John 2:19) Those that don't know cannot question whether those that truly know, know until they know themselves because they don't know how certain knowing is.